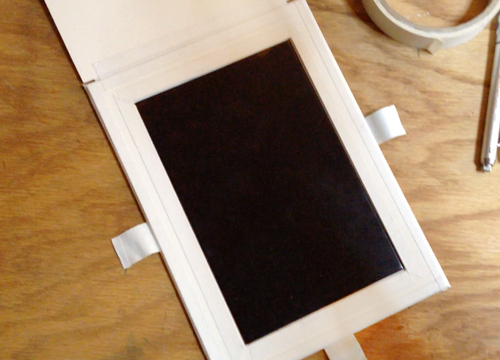 This is the next installment of Printmaking 101 with Smidgeon Press. In this demo, I’ll take you through beveling, polishing, and degreasing a copper plate. All photos for this demo were taken at Atelier Meridian. Beveling and polishing a copper plate is probably my favorite bit of tedium in etching; it’s a way of getting to know the surface, and a place to start if one suffers from a dearth of ideas. 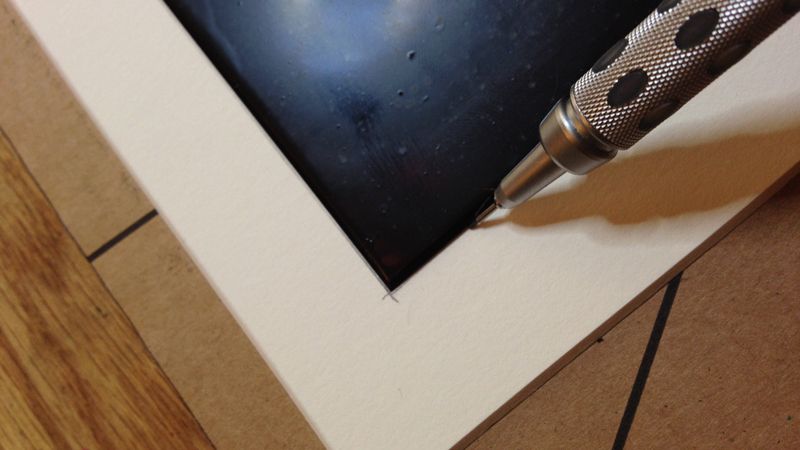 For me, that’s part of the alchemical nature of etching: the process leads to inspiration. I always tell students who don’t know what they want to make to just start preparing a piece of copper, and something will come of it. The repetitive, careful movements involved can be really tedious and boring for people, but I experience it as a form of meditation. Thinking of it as meditation, and more specifically as a way of getting to know the plate, helps make this necessary preparation enjoyable. There are plenty of methods and approaches to preparing a piece of copper, but I’m going to show you mine. I like to polish my copper to a bright, smooth, shiny finish so that my plates have very little or no plate tone. Set the copper on the drawer liner to help hold it in place. Some people use clamps, but clamps can damage the soft surface of the copper. 1. Start by beveling the edges of your plate. You want to give your plate a 45° bevel the whole way around. This makes it easier for the drum on the press to “jump” onto your plate. Heather McLaughlinlikens this to skateboarding: the press drum can’t ollie, so you need to give it a ramp. Keep in mind that the file’s teeth only work in one direction, so only use it in one direction (don’t see-saw it; you waste your energy and can hurt the file’s teeth). 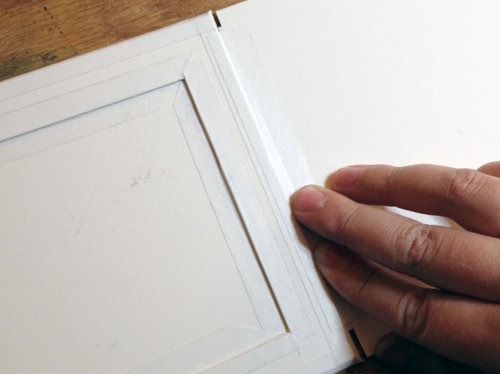 If the corners are sharp, file those a bit too, so that nothing on the plate will cut or pierce the paper when you print. 2. Once you have the edges nicely beveled, carefully brush all the copper shavings off of the surface of your plate and set aside that piece of rubber. 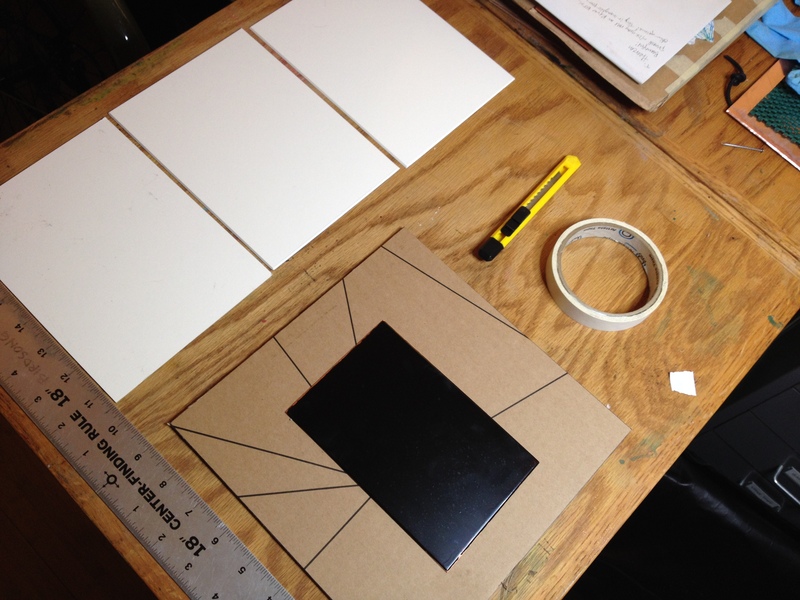 Set down a clean piece of newsprint; it should be a few inches larger than your plate in all directions. Get your 3-in-1 oil and your fine steel wool. 3. Put a few drops of the oil on the plate (no more than a few drops! ), and smear it around with your fingers. Note the direction of the grainof your plate. Pick up the steel wool and make smooth, even, straight strokes across the plate, in the same direction as the grain. Do this for at least five minutes. Fight the urge to make curved strokes or start/stop your strokes in the middle of the plate. Use light pressure; remember, you’re polishing a plate, not shaping it. Just like wood, copper sheets have grain, and one should always* polish in the direction of the grain, not across it. 4. Using a lint-free rag or soft paper towel, pick up your copper and gently wipe any steel wool hairs from the surface. If you use pressure, those little hairs will scratch! You’ll notice a bunch of them clinging to the newsprint, too. 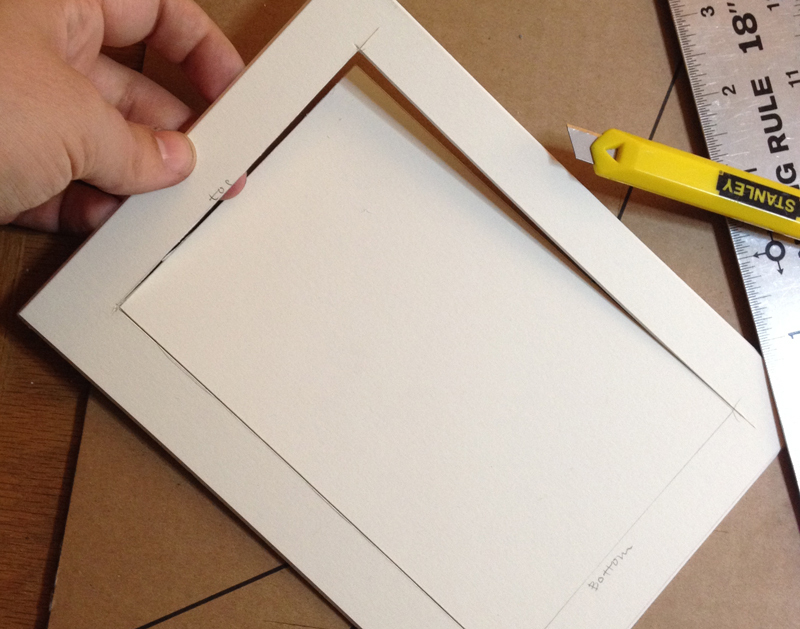 You can either get a new piece for the next step, or simply turn that sheet over. Make sure there are no steel wool hairs on or around your plate before you go on. 5. 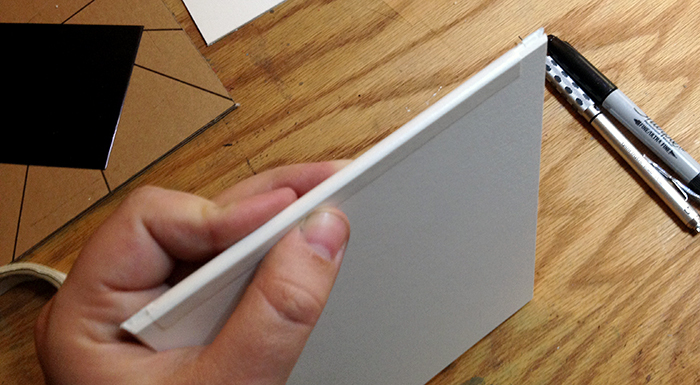 Get a piece of 2000 grit sandpaper, cut to the size of your palm or slightly larger. Set your sandpaper down on the plate, lay your palm on it, and continue making straight, even strokes in the direction of the grain. After a minute, you should see the copper start to brighten and become more mirror-like. Some people insist that you need to add 3-in-1 oil to the plate for this part too, but I find that the very small amount of residue left from the steel wool is enough, and people who add oil usually add too much, which only makes a mess. Keep polishing with the 2000 grit sandpaper until the plate reflects a clear image, like a mirror. Ta-Da! But I’m not quite done yet. 7. Put a little whiting and vinegar on the plate, in a ratio that will make a thin but not watery paste (only experience can tell you what the correct ratio is). Be careful not to inhale the powder or vinegar. Using a clean rag or sponge (or verywell-washed fingers, so there are no oils on your skin), mix the whiting and vinegar into a paste and work it over the whole plate in little, circular motions. Do this for at least a minute, or however long it takes you to go over the whole plate two or three times. I use my fingers, but this is generally not a great idea because the natural oils in your skin can counter-act your efforts. Use a soft sponge or cloth. 8. Rinse with warm or hot water (you can’t get steak grease off your dishes using cold water, can you?). Hot water can oxidize copper, however, so be careful. If the copper has areas of oxidation (dark spots, not white; if it’s white, then you still have whiting on your plate), flush the plate with a little soy sauce. Seriously, it works like a charm. Just don’t leave vinegar or soy sauce sitting on your plate: they are acidic, and will start to affect your plate if left on for too long. See how smoothly the water runs across the surface? That’s what you want. 9. Dry your plate off with a soft, clean cloth or paper towel. Now you are ready to ground your plate. *As with everything in printmaking, there are exceptions to this rule.